Jams & Preserves | Spices Etc. Straight from Grandma's kitchen comes our new Apple Pie Jam. Made from a family recipe, this jam has the real flavor of our grandma's homemade apple pies for your toast and PB&J's! 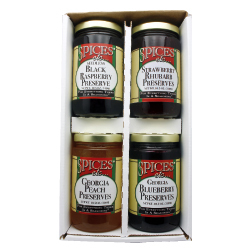 Made from fresh blackberries, this preserve is to die for! Spread it generously on sandwiches, bagels or toast. Great new flavor from Spices Etc. 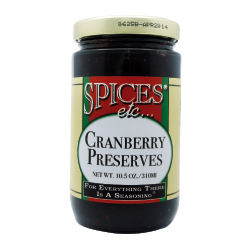 Made from the freshest cranberries, this preserve is the perfect compliment to your morning toast or bagel and it will be the rave the next time you put it out at your family meal. This is a preserve that truly gives us bragging rights at the table! Spices Etc. Fig Preserve uses fresh figs, preserved in a chutney-like jam that is wonderful when spread on pumpernickel toast or your favorite cheese spread. A winner for preserve lovers!! Spices Etc. Georgia Blueberry Preserves uses fresh blueberries picked in North Georgia are used to create this delicious blueberry preserve, full of blueberries and great on pancakes, bagels or scones. Spices Etc. Georgia Peach Preserves Jam is made with the finest Georgia peaches. This Georgia Peach Preserve Jam is the perfect addition to your morning coffee, toast or bagel. 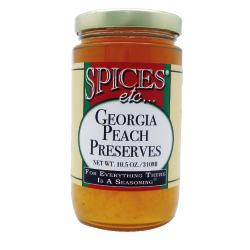 Our Georgia Peach Preserve Jam has an outstanding flavor, only from Spices Etc. Mornings will never be the same now that you will have your choice of 4 of Spices Etc. delicious jams and preserves. All are made using fresh fruits and ingredients and are sure to please......mmmmmmmm, good! Spices Etc. Peach-A-Cot Jam is the result of when you are experimenting, you get it right. Spices Etc. Peach-A-Cot is a blend of fresh peaches and apricots that creates a sweet jam perfect for french toast. From the kitchen of Spices Etc. comes a Strawberry Rhubarb Jam Preserves made from fresh ingredients and perfect to add to a toasted bagel with cream cheese or make breakfast a little more special.